Pharmacologic inhibition of JAK1/2 signaling phenocopies the protection from TLR9-inudced immunopathology observed in antibiotic-treated mice. C57BL/6 mice were treated with 5 doses of PBS or CpG1826 over the course of 10 days. 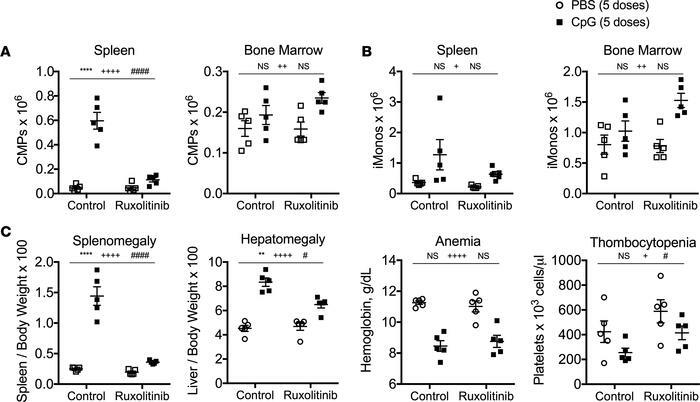 Mice received control chow or chow containing the JAK1/2 inhibitor ruxolitinib starting with the third injection. Numbers of bone marrow and spleen common myeloid progenitors (CMPs) (A) and inflammatory monocytes (iMonos) (B) were enumerated. (C) Clinical manifestations of cytokine storm were evaluated by measuring splenomegaly, hepatomegaly, anemia, and thrombocytopenia. Each graph displays representative data from one of 2 independent experiments (N = 5 mice per group). Analysis was performed by 2-way ANOVA (**P < 0.01, ****P < 0.0001, interaction; +P < 0.05, ++++P < 0.0001, control vs. ruxolitinib chow; #P < 0.05, ##P < 0.01, ####P < 0.0001, PBS vs. CpG in vivo treatments). The interaction term is CpG treatment x Ruxolitinib treatment.